Fitting kit required for perfect fit of the roof rack to a specific car. Fits specific models of Subaru, Kia, Jeep and Isuzu. Converts existing factory rack with raised side rails into full-featured Thule rack system. Requires Aero Crossbars. Provides the strongest hold, safest fit and easiest installation for the ultimate in roof rack technology and peace of mind. Requires Aero Crossbars. 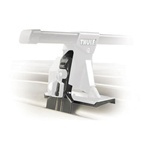 Low-profile foot for vehicles with integrated fixed point rack attachment locations. Requires AeroBlade Crossbars. Includes 2 Square Crossbars and 4 Feet to convert an existing factory rack with raised side rails into a full-featured Thule rack system.